The pressure is back on Liverpool in the Premier League title race after Manchester City strolled to a 2-0 win over Fulham. Goals from Bernardo Silva and Sergio Aguero ensured that the champions return to top spot. Elsewhere Manchester United got the job done 2-1 over Watford in Ole Gunnar Solskjaer’s first match as permanent manager, while results around the league saw Huddersfield Town confirm their relegation to the Championship. West Ham were booed off at halftime as they were beaten by Everton and there were also wins for Southampton, Burnley, Crystal Palace and Leicester. 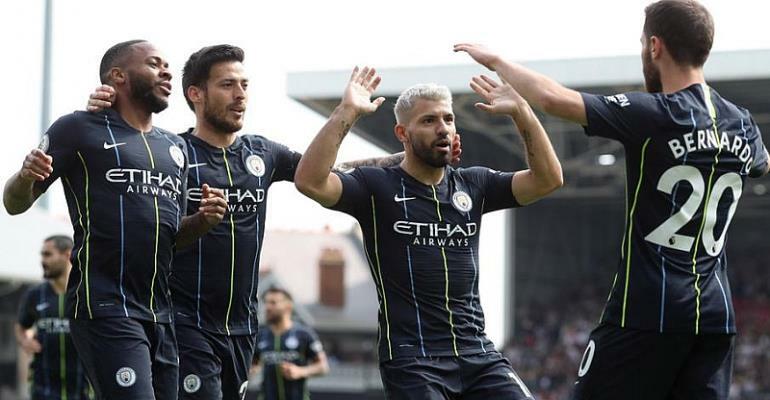 Bernardo Silva and Sergio Aguero sent Manchester City back to the top of the English Premier League after being gifted goals by Fulham to seal a 2-0 victory on Saturday. City moved a point ahead of Liverpool, which hosts Tottenham on Sunday but will have played a game more than Pep Guardiola’s defending champions. It is little wonder Fulham is next-from-last and facing relegation given the sloppiness of the defending before both City goals. A misplaced, casual clearance by Timothy Fosu-Mensah in the fifth minute was seized on by Kevin de Bruyne. Aguero received the ball from the Belgian and he teed up Bernardo Silva to strike low into the net. Fulham was so ineffective on the ball that, when the hosts finally strung passes together in the 15th minute, there were ironic cheers around Craven Cottage. It was a brief intermission from the City supremacy. Goals from Marcus Rashford and Anthony Martial secured a scrappy 2-1 home win for Manchester United against Watford in the English Premier League on Saturday as the Red Devils leapfrogged Arsenal into the last Champions League spot. 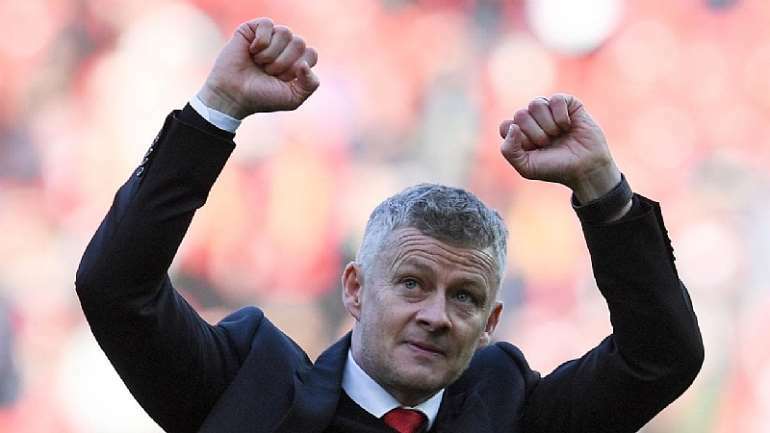 As Ole Gunnar Solskjaer celebrated his first match in charge as permanent manager, the win lifted United to fourth in the standings, one point above the Gunners. Arsenal has a match in hand. On a sunny afternoon at Old Trafford, United did not impress. Rashford concluded one of his team’s few chances at the end of a rapid counterattack to give the hosts the lead in the 28th minute. Watford continued to dominate after the interval but Martial doubled United’s lead from close range in the 72nd. Abdoulaye Doucoure pulled one back with a last-minute effort. Southampton enjoyed a double boost on Saturday by taking a significant step toward English Premier League survival with a 1-0 win over Brighton, and increasing the relegation concerns of its south coast rival. Saints captain Pierre-Emile Hojbjerg earned the visitors victory at Amex Stadium by scoring his first goal since December. Southampton winger Nathan Redmond’s driving run and perfectly weighted pass slipped Hojbjerg in on goal and he produced a composed poke past Mathew Ryan and into the bottom right corner in the 53rd minute. Brighton almost leveled when right-back Martin Montoya crashed a shot against the crossbar from the edge of the box with 18 minutes to go. Chris Hughton’s side, which grabbed a last-gasp equalizer at St Mary’s in September, was unable to salvage a draw. In the day’s late game, West Ham United, after six unbeaten matches at the London Stadium, came unstuck with a lacklustre 2-0 home defeat by Everton Goals from Kurt Zouma and Bernard moved Everton above the Hammers into ninth, one point behind Wolves and Leicester. Burnley boosted its hopes of avoiding relegation from the English Premier League by beating Wolves 2-0 on Saturday to end a run of four straight defeats. Burnley still hovered just above the drop zone after its first top-flight win over Wolves since 1963. Conor Coady’s third own goal of the season launched Burnley within two minutes, and teenager Dwight McNeil showed composure to fire into the bottom right corner and put the result beyond doubt in the 77th. It was one of Burnley’s few chances in the second half. The win helped Sean Dyche celebrate his 300th match in charge of Burnley. Huddersfield Town’s relegation has been confirmed after they lost 2-0 at Crystal Palace to become the second team in the English Premier League era to go down before the end of March. Wins for Burnley and Southampton sealed the fate of Socceroos midfielder Aaron Mooy’s club, as they matched Derby County’s record, set in 2008, for the earliest relegation from the Premier League after 32 games. Huddersfield were doing a good job of frustrating Palace in the Selhurst Park sunshine on Sunday, with the hosts rarely threatening until the latter stages. Huddersfield’s resistance was broken after Wilfried Zaha was fouled in the penalty area in the 76th minute and Luka Milivojevic converted from the spot to put Palace in front. Patrick van Aanholt’s late goal sealed the win, as Huddersfield slumped to their 24th defeat of the season. Brendan Rodgers celebrated a third victory in four games at the start of his managerial reign as Leicester beat Bournemouth 2-0 in the English Premier League on a day of fresh tributes to the club’s former owner. With Harry Maguire suspended, 35-year-old captain Wes Morgan started and scored in the 11th minute on Saturday. Jamie Vardy added a second in the 82nd, beating Asmir Begovic to Youri Tielemans’ cross to head the ball into an empty net. The 61st minute was an emotional moment inside the stadium as Leicester fans united to applaud the memory of former chairman Vichai Srivaddhanaprabha, who would have celebrated his 61st birthday in the coming days. Vichai died, along with four others, in a helicopter crash just outside King Power Stadium in October. Leicester are eighth on the league table and Bournemouth are 12th.